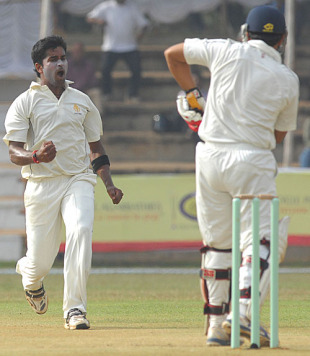 He has 179 Ranji Trophy wickets at 22.15 over six seasons, in each of which he has scalped more than 20. He was the domestic bowler of the year in 2007-08 after dismissing 47 batsmen in nine matches. Despite these achievements, Karnataka seamer R Vinay Kumar remains unfamiliar to most Indian fans, and he didn't even find a place on the BCCI's 41-man list of contracted players last November. "It's a real big surprise for me why he's not made the next level," his state coach Sanath Kumar says. "He bowls at about 130kmh, which is pretty decent, moves the ball both ways and is very accurate." This season has been Vinay's finest yet. With the added responsibility of grooming two young, talented quick bowlers in Abhimanyu Mithun and S Aravind, he has been at the forefront of Karnataka's charge to the final. His 43 wickets put him on top of the Ranji charts this season, including a personal-best eight-wicket burst against Delhi, and on the big occasion of the final, he calmed the team nerves by slicing through the Mumbai top order. Vinay debuted for the Karnataka Ranji side as a 20-year-old in 2004-05, when the team was looking for the next generation of fast bowling talent after the retirement of David Johnson and with another stalwart, Dodda Ganesh, fading. He was an instant success, getting the wickets of Sourav Ganguly and Rohan Gavaskar on debut, and has played in nearly every Karnataka match since. He is deeply disappointed at not making it to the national team so far. "I feel bad that no one is recognising me. Everyone knows that I've been doing well for the last six years," Vinay says. He turned to Anil Kumble and Rahul Dravid for advice, and their guidance kept him focused. "They would say that your day will come. Don't get desperate. If you are, then your bowling will suffer and you may start doing new things that will spoil your bowling." He also sought the counsel of one of his first coaches, LM Prakash, from his hometown of Davanagere. "I keep telling him to concentrate on bowling well and not to bother about the results," Prakash says, "to keep enjoying himself, keep performing for the team to win, and wait for his time to come." Now 25, Vinay is at an age by which most Indian cricketers have already made the breakthrough - several competitors for a national pace-bowling spot like Sreesanth, RP Singh and Munaf Patel are roughly as old as him, while Ishant Sharma, Praveen Kumar and Sudeep Tyagi are younger. Perhaps there is a different route to the top? "I'm making him realise that he has to get into the national team as an allrounder," Sanath says. "Probably the place which has been left vacant by Irfan Pathan. I'm telling him all the time he has got tremendous potential as a batsman." Vinay started out for his first club, United Cricketers, as a batsman, idolising Dravid and wanting to copy his batting style. "He was concentrating more on his batting initially," Prakash says, "There was a bowling coach Prakash Powar, a fast bowler for Goa, who thought there was talent in Vinay as a medium-pacer. He made him bowl at the nets and Vinay started playing as an allrounder. Gradually, as he progressed to the higher levels, his bowling started getting more recognition, but even up to the zonal under-19s he was scoring plenty of runs." Two seasons ago, during former India allrounder Vijay Bharadwaj's tenure as Karnataka coach, Vinay was tried as a pinch-hitter for the Vijay Hazare Trophy. The experiment was a partial success: he made a quickfire 32 and a couple of half-centuries in six innings. "All my coaches tell me I have a good technique in batting, and want me to concentrate on that," Vinay says. "After getting so many wickets, I'm not getting enough recognition. I have to score. Now, slowly, I'm concentrating on my batting as well."